This is the Place d'Armes in Monaco, where the market is held each day. Here you see it without the market stalls. 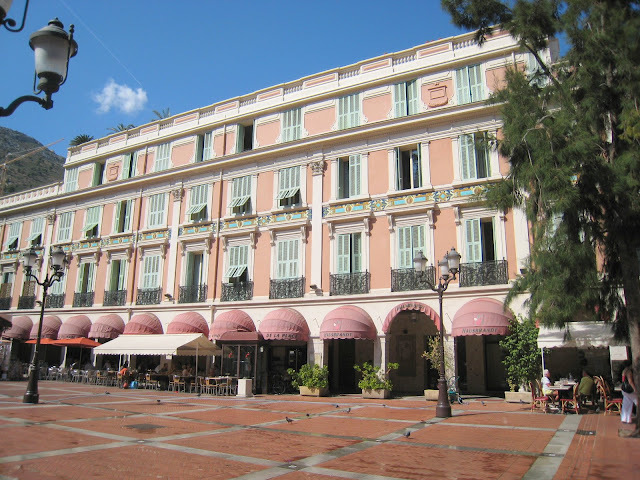 The colour of the shutters, the decoration and the ironwork is typical of many buildings in Monaco and the south of France. So pretty, don't you think? Yes, very pretty. And the cafe on the right looks like a great place to have a cup of coffee and croissant. The pastel colors are very pleasing. I never noticed the lovely architecure there - always was distracted by the marché! i could stare at this picture for hours. :) I love your Blog. I grew up in Monaco, but left for the States in 2000 so it's fun/nostalgic to follow your blog. Oh thankyou for the kind words, CalTexMes. So glad you like the blog and thank YOU for the commentaries. Hopefully you'll be back in MC from time to time. I do come back every other year. I was there this past June. The light on the coast is so special and some of your pictures capture that and take me right back there. I can tell just by looking at the quality of the light on some of your pictures what time of the year they were taken at. You do take some really good shots.